Walmart's 'Buy American' Push: Patriotism or Red, White and Blue-Washing? Earlier this year, Bill Simon, Walmart's president and CEO, unveiled a new plan to spur American industry and employment: The company committed to hiring 100,000 veterans within five years and to increasing its sales of American-made products by $50 billion within 10 years. But this week, as the retailer hosted a two-day "US Manufacturing Summit" in Orlando, questions are surfacing about whether the new initiatives are good deeds -- or just good marketing. An increase of $5 billion a year in American-made goods is nothing to sneeze at. Then again, as Time's Christopher Matthews notes, Walmart (WMT) already increases its purchasing by an average of about $15 billion a year. In this context, the $5 billion it plans to spend on items that were made in America works out to about a third of yearly growth. And, according to Walmart's Simon, the company already spends two-thirds of its money on goods that were grown or made in America. In context, then, it would appear that Simon isn't even promising to maintain the company's current level of spending on American-made goods. Over at Salon, Stacy Mitchell suggests an even darker interpretation. Noting Walmart's expansion into grocery shopping, she points out that most groceries consumed in the U.S. are produced in the U.S., a factor that may help account for the company's promise to buy more American products. Given Walmart's notorious tendency to underpay its workers -- a significant percentage of its employees have to resort to using welfare programs -- this move to expand its already strong presence in the grocery segment is bad news for American wages. Many other grocery chains pay their workers better than Walmart (some even have unions), and if they lose more market share to Bentonville behemoth, they'll cut jobs. Some of those jobs will be replaced by lower-paying ones at Walmart, with at least one result being a higher cost to the taxpayer-funded programs that currently underwrite the retailer's low, low prices. Walmart's push to buy American is certainly good business: According to a Gallup poll released earlier this year, 45 percent of Americans said that they "recently made an effort to buy products made in the United States." 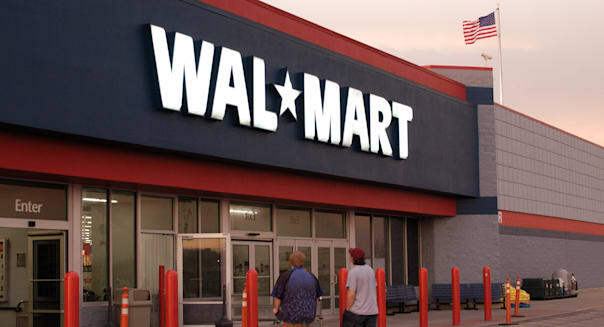 If Walmart can associate itself with that trend -- if it can become a place where Americans go with the feeling that they're supporting U.S. jobs -- it would be a big boon to the retailer. If you're looking to buy American, there are quite a few resources that can help you find manufacturers and retailers who carry American-made products. Made In USA Challenge has a database of American manufacturers, as does Americans Working. Both databases have shortcomings: Made In USA is a bit hard to search, and Americans Working sometimes has dead links, but if you want to find jeans made in Ohio or a grill made in Oregon, they're great places to start.